Select dates in April/May are offered at $95/night not including fees. Please send me a message if you have additional pricing questions. *Our first floor 800 square foot unit sleeps 6 IN BEDS (not including the pull out sofa). *queen size bed with new memory foam topper in master bedroom. * infant items (pack n play) available upon your request. * All mattresses and pillows are protected by Linenspa encasements. * Separate sink and vanity area with many drawers and hairdryer. *Meals can be easily prepared for a party of 8 on granite countertops with newly purchased flatware, Corelle dishes, cookware, crockpot, and a variety of cookie sheets, pizza and muffin pans. *All appliances are full sized, including toaster oven and 12 cup coffee maker, Keurig and small 4 cup Mr coffee style. * Newly purchased Samsung large capacity front load washer and dryer is located off the kitchen. *The outdoor patio has four teak chairs with cushions and two coffee tables. *This unit is unique in the fact that you are able to watch your children play in the pool area from your patio. 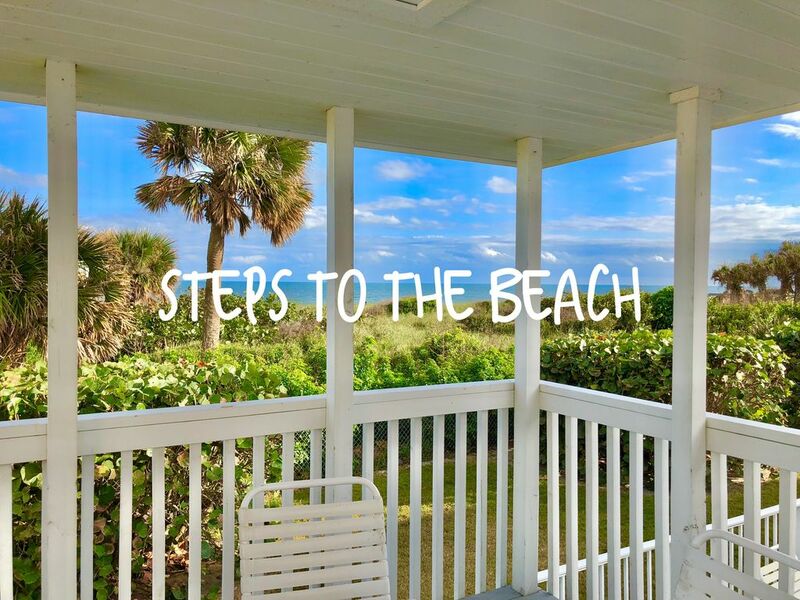 *Beach towels, pool towels, 3 large boogie boards, 2 coolers, beach cart, umbrella, two mesh Ron Jon beach toy bags and 4 beach chairs are provided in the unit. english, Send a message, get an immediate response! We are a private family owner who recently purchased this condo as a weekend retreat and lifelong dream to own property on the ocean. We have been married for 18 years with 4 children and live within 30 minutes of the property. We purchased "endless summer" with the intent to share our love of the beach with others, knowing what is necessary and expected during a vacation with children. We frequent the property often, routinely updating, replacing and cleaning. Our family has been using VRBO on the "renters side" for many years and still use to this day providing us with insight to make your stay the best it can be. We have lived in Florida for the past 10 years under constant review of oceanfront properties within a 30 minute radius from our home. After much consideration, we finally decided on the Royal Mansions complex due to its quiet location yet close proximity to all the tourist destinations. We consider our property to be in the perfect location for enjoying a vacation with family who want to be on the beach, yet have peace and quiet. We are one of the only completely renovated, ground floor units with availability to watch your family swim in the pool/hot tub from your patio. We also made sure to upgrade the condo with a full size front load washer and dryer that is a life saver when traveling with children. The second living area is outfitted to provide a quiet place to drink coffee in the morning if the sofa bed and murphy bed is in use. We also realize that it is appreciated to have high end luxuries like 1200 count, cotton sheet sets as well as a spa like shower and separate deep soaker tub. We are located on a dead end street with private walking paths that are inhabited by peacocks. We also decorated our condo with local art that can be purchased on your request. Accessible from bedroom and main living area. Separate stand alone roll in shower with bathtub. Vanity area with sink. I supply: soaps, shampoo, conditioner, lotions, makeup remover pads, and many extras in case you forget! You control the heat/air conditioning. I do not put limits on your comfort! 1200 count cotton sheets supplied for the queen, murphy full size bed and full size sleeper/sofa. Also linen for twin aero bed. Blankets on all beds with extra comforter and throws also in the condo. Purchased new in 2017 large front load washer and dryer. I supply detergent and bleach. 2 parking passes provided in the condo, please return at check out. If more passes are needed please let me know ahead of time. Also, motorcycles, trailers, even/campers and boats are not permitted. Newly installed 7/2018 AT&T Uverse private internet. Two living areas with sofa/sleeper and rocker/recliner. L shaped sofa in sunroom. Keurig Pro with many varieties of coffee pods provided. toaster/oven combo with small pan for cooking bacon/sausage and muffin pan too! Spices, oils, filters, coffee, creamer, sugar, popcorn and snacks! Service for 8-with many extras! So nice to have disposable Solo cups and disposable coffee cups/lids for on the go! Crock Pot for easy dinners ready after a day at the beach! Full size appliances with all dishwear/utensils/cookwear/Keurig machine and Mr Coffee pot. Many items supplied for you! Coffee, filters, creamer, sugar, spices, oils, and snacks! Paver patio overlooking the pool/hot tub. Four new teak chairs with cushions and two small tables. Very Comfy! ground unit with heavy duty grab bars and roll in shower. Narrow wheelchair works well with doorways and pocket door entry to bathroom. Located right outside your door. Private to Royal Mansions guests only, access through secured gate. heated in the winter months right outside your door! Wonderful location near many of the sites we wanted to visit. Easy access to the beach. The condo is well appointed and comfortable. Gretchen provided us with fresh baked muffins and everything in the condo was exceptionally clean. The pool is shared and got a little busy and crowded at times. Our stay at "Endless Summer" was wonderful! The unit was well maintained, very clean, and most comfortable. Gretchen went beyond supplying the essentials - amenities included everything needed for a day at the beach- toys, chairs, coolers, body boards and more. We wish our grandchildren were with us to enjoy the games, toys, pool, and beach. Communication with Gretchen was easy - text messages were ideal. Looking forward to our next stay! Great condo for our family of 4. Loved the location and all of the amenities provided. Beds were super comfy! We had a great time our sons loved your place. He had the best 4th birthday!! Thank you for allowing us to use your place. Wonderful experience. Beautiful spot and beautiful unit. Very well done! Thank you Bill and Eloise for simply summing up a great stay! Hope to see you again!! Royal Mansions Resort is located on a dead end street nestled along 700ft of private beach. Nature path North of the building leads through live Oaks with peacocks wandering. Many activities are located within Cape Canaveral/Cocoa Beach area including Golf N Gator and Cocoa Beach Aerial Adventures. Please let me know what you are interested in and I will be sure to arrange multiple options for you!